See the Grand Canyon's vistas from the less visited but equally stunning North Rim. The Grand Canyon's North Rim is less popular than the South Rim but no less beautiful. Located at Bright Angel Point, the historic Grand Canyon Lodge overlooks the North Rim. As one of the seven natural wonders of the world, the Grand Canyon is a majestic sight to behold. The world-famous landmark, which is located in Grand Canyon National Park, is 277 miles long, almost 18 miles wide, and more than a mile deep. The canyon’s stunning natural beauty attracts almost 5 million visitors each year to marvel at its jaw-dropping scenery. Nearly 90 percent of those who visit the Grand Canyon take in the spectacular views from the park’s free shuttle buses or from their car at overlooks along the South Rim, according to the National Park Service. The South Rim, though, is not the only place to witness the Grand Canyon’s exceptional panoramas. While it’s a bit of a mystery to some, the North Rim is an equally magnificent vantage point to see the amazing steep-sided gorge carved by the Colorado River. At 8,000 feet and only 10 miles across, the North Rim sits 1,000 feet higher than the South Rim, which many believe creates a visual advantage that is more expansive. And the secluded wilderness location provides a rugged solitude that is distinct from any other canyon experience. Despite its unique features, only 10 percent of Grand Canyon visitors travel to the North Rim. A main factor is it has a shorter tourism season due to weather — lodging, food, and visitor services are open from May 15 through Oct. 15 each year. The North Rim, which forms the edge of the Kaibab Plateau, also draws fewer people because the only way to reach it is by hiking across or driving to the entrance, which is about 30 miles south of Jacob Lake, Arizona, not far from the Utah border on Highway 67. While remote, it’s an accessible and scenic drive through a lush mixed-conifer forest. Once you reach the North Rim, the sole hotel accommodation inside the park is the historical Grand Canyon Lodge. Located at Bright Angel Point, the rustic lodge was declared a National Historic Landmark in 1987 and was built with natural stone and timber to reflect the canyon’s natural setting. Pioneer, western, and frontier-style cabins, some which directly overlook the rim, are available, as well as motel rooms. Dining at the lodge includes The Deli in the Pines and The Grand Canyon North Rim Dining Room, which serves breakfast, lunch, and dinner, and is a certified-green restaurant. It features a regional and American-inspired menu including steak, buffalo, elk chili, roasted chicken, trout, crab cakes, prime rib, seasonal produce, and vegetarian options — all with unobstructed views of the canyon. You also can grab beverages and breakfast items at The Coffee Shop & Roughrider Saloon. A popular pastime at the Grand Canyon Lodge is to sit in the wooden chairs on the wrap-around porch positioned on the rim’s edge and reflect on the serene quietness of this canyon perspective. The Grand Canyon Lodge books up fast, but if there’s no room at the inn you can set up camp at the North Rim. The NPS North Rim Campground, which has 89 sites, is located by the Grand Canyon North Rim Visitor Center, and is the only camping area for tents and RVs. Restrooms are included, with laundry and shower facilities available for a fee. It’s pet-friendly but animals need to be on leashes and supervised at all times. There are no RV hook-ups, although there is a dump station at the campground. It’s enough to do nothing and just sit quietly in awe of the canyon’s vibrant colors, jetting geographic formations, and shifting shadows. Yet visitors to the North Rim can participate in many activities that offer unique portals into the incredible landscape. One way to experience the setting is through the ears of a sure-footed mule on a guided tour with wranglers from Grand Canyon Trail Rides. Mule trips include: a one-hour ride; a half-day inner-canyon adventure, which descends 2,300 feet down the North Kaibab Trail into the Supai Tunnel; or a half-day trek from Ken Patrick Trail to Uncle Jim’s Trail. Horses are not permitted on the inner narrow canyon trails, but it’s possible to book a horseback ride along the North Rim and through the Kaibab National Forest. Another option to explore the North Rim’s vast expanse and observe the breathtaking nature is to take a tranquil day hike. The Bright Angel Point Trail is an easy and quick half-mile, round-trip, paved hike that starts at the log cabin next to the North Rim Visitor Center parking lot. From the trail, you can see and hear Roaring Springs 3,000 feet below. The Ken Patrick Trail is a moderate but long hike that winds through the forest and along the rim, from Point Imperial to the North Kaibab Trail parking area. It has multiple viewpoints and most hikers take the 10-mile, one-way trail and prearrange a ride for the return. To get one of the most sweeping views of the canyon, take the easy (0.6 miles round trip) Cape Royal Trail, a long peninsula that extends over the Grand Canyon and has a view of Angels Window, a photogenic arch. The trailhead parking area is at the end of the paved Cape Royal Road, which circles northeast and then south from the main road leading to the visitor center. The North Kaibab Trail (28 miles round trip) is difficult but demonstrates the sheer vastness of the canyon. The trailhead starts at the top of Roaring Springs Canyon, along the main road before the visitor center and lodge, and passes through every type of ecosystem found between Canada and Mexico. Park officials recommend day hikers turn around at Roaring Springs (9.4 miles round trip) because the steep trail is shared by mule rides and there is no water source en route. Plus, it’s the only North Rim trail that descends into the canyon, so overnight permits are required if hikers continue to the bottom. Although mountain biking is illegal on trails below the rim, you can follow the North Rim along the Rainbow Rim Trail or take the Arizona Trail, which starts at the North Kaibab Trailhead and explores the Ken Patrick Trail forests and plains. If you prefer to appreciate the still beauty of the Grand Canyon by car, follow the Cape Royal Scenic Drive along the North Rim with stop-and-look viewpoints of Point Imperial, Vista Encantadora, Roosevelt Point, Walhalla Overlook, Angel’s Window, and Cape Royal. The driving tour is popular for watching sunrises and sunsets and is approximately 23 miles from the Grand Canyon Lodge. Whatever activity — or path — you choose to take while at the Grand Canyon’s North Rim, relish in the fact it will be the road less traveled. Pay the park price: Effective May 1, entrance to the North Rim is $25 per car and $12 per pedestrian or bicyclist (good for seven days). A 12-month Grand Canyon Pass is $50. You also can purchase the America the Beautiful — National Parks and Federal Recreational Lands Pass for $80. There is a backcountry fee of $10 for a permit and $5 per person per night. Get a North Rim education: Park rangers and volunteers provide free, daily interactive programs including nature walks, geology talks, and history and cultural lessons about the Grand Canyon from May 15 to Oct. 15. Children ages 4 and older also can earn a free Junior Ranger certificate and badge at the North Rim. Look out for condors: The Grand Canyon National Park participates in the condor reintroduction program with encouraging results, making it one of the easiest places to view California Condors, one of the rarest birds in the world. Camping at the canyon: The NPS North Rim Campground campsite fee is $18–$25 per night with restrictions; group, hiker, and biker sites also are available. Reservations are required and walk-ups are not allowed. For more information, contact the National Recreation Reservation Service at 1-877-444-6777 or visit recreation.gov. 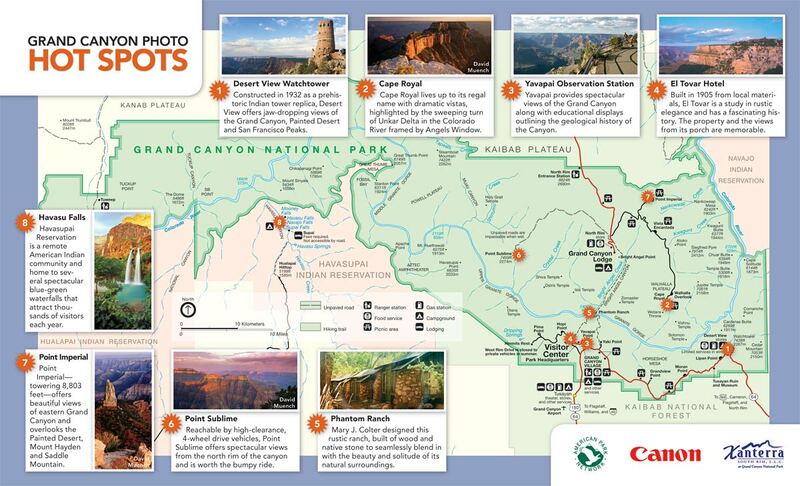 Hit a photo hotspot: To snap the best photos of the Grand Canyon’s North Rim, check out the National Park Services’ photo hotspot guide for advice on the best times and places to shoot, including Desert View Watchtower and Cape Royal to name a few. This article was first published in Arizona Highroads in July/August 2015. Some facts may have aged gracelessly. Please call ahead to verify information. In honor of the recent centennial, visit one of Arizona’s four primary natural treasures. Here are eight of the most incredible things to see in our amazing national parks. Traveling alone has a lot of perks, from meeting new people to changing your mind on a whim.